I make every attempt to create and discover recipes that I think are easy to make and have a wide appeal. My family is the first to judge the recipes that are posted, and there sure have been some that haven't passed the test! I really appreciate when I receive comments from visitors or subscribers to this site, especially from people who have found a new favorite recipe. Here are some ratings and reviews from viewers. "Just wanted to let you know that my family can't stop raving about theLoaded Potato Soup It's wonderful. Thanks for a wonderful site". 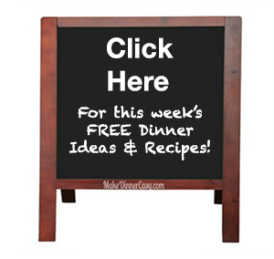 "I have to say thanks for some fabulous weekly recipes. Working the farm, it's hard to find time to look up new recipes...thank you for saving me so much time!" "I made the Flank Steak Stuffed with Rice last night and Tim said he'd be happy with that at least once a week! I've also made the Healthy Waldorf Salad and it has become a family favorite. Thanks for all the great and EASY recipes!" "The Flourless Chocolate Cake was a BIG hit!!! It was soooo easy to make and tasted delicious. My sister is planning to make it this weekend for her company. Thanks again for all of your great recipes. It is my favorite part of the day when I get your E-Mail." "As a new stay at home mom I had no idea how stressful it could be planning, shopping, and cooking dinner for my family. I love "Make Dinner Easy" because it simplifies everything! Being able to find delicious, healthy, and easy to make meals in one click is priceless. Thanks for saving me so much time andproviding us with such tasty recipes!" "I enjoy your web site so much. I made the Passover Brisket , and theFlourless Chocolate Cake . Yum!! It was a huge success with my family. I have passed this site onto my friends and family. I love it!! Thanks!" "I recently came home after a long weekend of soccer tournaments and tried the Fettucine with Roasted Asparagus and Goat Cheese...So easy, time efficient and delicious! It was devoured by the whole family! This website is a tremendous help for putting together great family meals". "Your recipes are just phenomenal!"